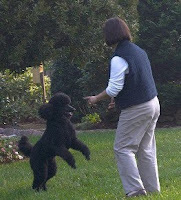 Poodle Blogger: No More Jumping Up! It is not difficult to find advice on how to cure jumping problems. From your next door neighbor, to your veterinarian, to the trainer in the local pet supply store, all are full of advice. With all this advice readily available, why do dog trainers' phones ring every day, with folks begging for help because their dog is jumping all over people? The answer is fairly simple. Traditional advice is flawed. It either focuses totally on teaching the dog to sit instead of jump (I'll tell you in a moment why this is not the total cure) or it focuses totally on a punishment administered after the behavior has already occurred. It leaves out the two important things--one, prevention is the best cure and two, we must teach our dogs to look to us for direction and protection instead of allowing them to make their own decisions. No one lets their children run up and jump into a stranger's arms . Kids always must look to their parents for permission before they approach anyone. Why should our dogs be any different? 3. Teach a replacement behavior that is incompatible with the inappropriate behavior. For example, a dog cannot sit and jump up at the same time. In addition to a very reliable "sit", it is important to also teach the dog a four-on-the-floor command, such as the stand for exam. This simply means that the dog must stand, in one place, for petting, the same as he might be taught if he were at a dog show and the judge was examining him. 4. Choose an appropriate consequence for choosing not to obey. Once your dog has been thoroughly trained to sit or perform a stand-stay, but chooses instead to try to jump on someone, he should receive an effective correction. Corrections do not come after the event, but preferably just as the dog is "thinking" about jumping, so that it prevents the jump. Then quickly re-direct him back to what you have asked him to do. Use of a slip lead, or a slip collar, to give the dog a quick collar correction can easily interrupt the behavior and help the dog to re-focus on you. It is important to give the collar correction to the side, or downward, as opposed to pulling upwards. Don't feel guilty about teaching your dog what the word "no" or "stop" means. But anything verbal needs to be simple and quick, not loud or exciting (which will just up the dog's adrenaline level, making the problem worse). Like Cesar of National Geographic's Dog Whisperer fame says over and over - be calm and assertive. Loud angry corrections can either frighten our dogs, make them more excited or simply make them think we are losing control. A calm but firm "no" paired with a leash correction, then a redirect "Fluffy, stand....stay" works much better. To recap, teach the dog an appropriate replacement behavior (such as stand-stay and sit-stay.) As soon as the dog understands the replacement behavior, then add a consequence for choosing to jump up. Be quiet as you give the correction, then redirect the dog into the sit or stand-stay. Do not praise, treat or pet the dog unless he is remaining in position. If he pops up, walk into him, forcing him to walk backwards. This balanced approach of both rewarding appropriate behavior and correcting inappropriate behavior will help him learn quickly. Nationally known trainer Mary Mazzeri states "A balanced approach puts some responsibility for making choices on the shoulders of the dog. They know that they will both avoid discipline and earn rewards when they make the right choices." I could not agree more, particularly when teaching our dogs impulse control choices like proper greeting behavior. (c) 2007-2010, Melanie Schlaginhaufen. May not be reproduced without written permission from the author.